Not only is it simply annoying and uncomfortable when it happens from time to time … when it’s left unchecked, chronic constipation can lead to more serious problems. Let’s face it … people always feel better when they have moved their bowels daily. And, from a medical perspective, daily bowel movements are a necessity. It’s critical for removing toxins from the body and to help expel metabolic waste. Including excess estrogen. I firmly believe that one of the reasons so many women suffer from breast cancer is because many are chronically constipated. And this is just one of MANY potential benefits to regular bowel movements. Researchers in New Zealand looked at two specialized kiwifruit extracts. One from the more familiar green kiwifruit, as well as one from the gold variety. The study was small — just 19 healthy people and 9 who were constipated. Participants took the supplements for four weeks. And then switched over to placebo. Now, unfortunately, those who were constipated didn’t find much benefit. However, it’s always easier to maintain regularity from the start … and the good news is, both kiwifruit extracts did show a statistically significant benefit. 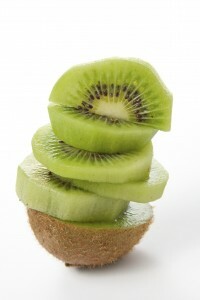 Researchers concluded that the kiwifruit extract may indeed increase the amount of bowel movements in healthy people. And without affecting “stool form.” In other words, it didn’t result in overly loose stool or diarrhea. Which is always welcome news. Overall, the kiwi has plenty of credentials that probably contribute to its GI benefits: the insoluble fiber (which also acts as a prebiotic), the polyphenols, and an enzyme known as actinidin (which is the reason for the name of this particular branded extract–Actazin™). To make this supplement, the skin and seeds were removed while the rest of the fruit was pressed. That reminds us of one of the major benefits of kiwi in supplement form: it’s, quite simply, better for you than eating a whole kiwi fruit. The reason: sugar. A small kiwi has 13 grams of sugar. So I would stick with the supplement form here, to avoid all that sugar. Also notable: this was a double-blind, placebo-controlled study with a crossover, which means that participants who were in the group receiving the supplement were then subsequently placed in a group NOT receiving the supplement. One of best ways to conduct a study if you can swing it. And fortunately, the makers of this ingredient were willing to invest in the science to make sure they developed a product that would actually work. Next up on the list for these researchers (and something I’d be focusing on, pronto): looking at other digestive health markers such as immune function and microflora composition to see if kiwi supplements can help overall GI health. Another “green” supplement my patients find very useful for regularity is aloe capsules. However, many of them find it difficult to adjust the dosage without getting diarrhea…that’s why the kiwi supplements may be a worthy alternative. And of course, you should already be taking a high-quality, multi-strain probiotic every day (the brand I generally recommend is Dr. Ohhira’s). It should be as routine as brushing your teeth.